Philip Joseph Cavarretta (July 19, 1916 – December 18, 2010) was an American Major League Baseball first baseman, outfielder, and manager. He was known to friends and family as "Phil" and was also called "Philibuck", a nickname bestowed by Cubs manager Charlie Grimm. 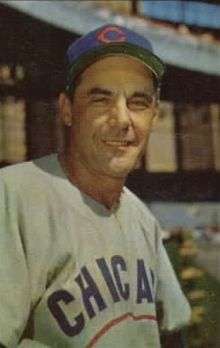 Cavarretta spent almost his entire baseball career with the Chicago Cubs. He was voted the 1945 National League Most Valuable Player after leading the Cubs to the pennant while winning the batting title with a .355 average. His 20 seasons (1934–1953) played for the Cubs is the second-most in franchise history, behind Cap Anson. He managed the Cubs in his final three seasons with the club. Cavaretta attended Lane Tech High School in Chicago, and signed a professional contract with the Cubs before finishing high school. In his first professional game with Peoria at age 17 in 1934, Cavaretta hit for the cycle as a right fielder. That same year he was brought up to the Cubs to replace manager Charlie Grimm at first base. He first appeared in a major league game on September 16, 1934, less than two months after his 18th birthday, pinch-hitting unsuccessfully for the Cubs' shortstop Billy Jurges in the fifth inning of the first game of a doubleheader in Brooklyn. A week later, on September 25, in his first start and his first appearance at the Cubs' home park, Wrigley Field, Cavaretta hit a home run that supplied the winning margin in the Cubs' 1–0 win over Cincinnati. In his 1935 rookie season, he batted .275 with 82 runs batted in, also leading the league in double plays, as the Cubs captured their third pennant in seven years by winning 21 straight games in September; however, he batted only .125 in the World Series loss to the Detroit Tigers. Over the next several seasons he provided solid play at first base, routinely batting between .270 and .291 every season but one through 1943, though he lost significant playing time from 1938 to 1940 due to a hip injury and an ankle broken twice while sliding. In the 1938 World Series against the New York Yankees, he batted .462 as the Cubs were swept. Exempted from World War II service because of a hearing problem, in 1944 Cavaretta batted .321 with a league-high 197 hits, had career highs with 106 runs, 35 doubles and 15 triples, and earned his first of four straight All-Star selections (reaching base a record five times in the game) though the Cubs suffered their fifth consecutive losing season. But the team improved by 23 games in 1945, edging the defending champion St. Louis Cardinals by three games for the pennant as Cavaretta was named MVP. That season he also had a career-high 97 RBI, leading the NL in on-base percentage and finishing third in slugging average. He batted .423 in the World Series against the Tigers, though the Cubs again lost, in seven games. In Game 1, he singled and scored as the Cubs took a 4–0 lead in the first inning, singled and scored again in the third, and homered in the seventh as Chicago took the opener 9–0. He scored the Cubs' only run in Game 2, and in a 12-inning 8–7 win in Game 6 had a 2–RBI single and scored a run; he had three hits in Game 7, but the Cubs lost 9–3. He made the All-Star team again in 1946 and 1947, batting .314 the latter year, as the Cubs again fell back in the standings. He was named manager in June 1951, succeeding Frankie Frisch. Continuing as manager for two more years, he compiled a record of 169–213. In 1953, his final season with the Cubs, he surpassed Stan Hack's modern team record of 1,938 games; Ernie Banks would eventually break his mark of 1,953 games in 1966. Cavaretta was fired during 1954 spring training after admitting the team was unlikely to finish above fifth place (they finished seventh), and in May he signed with the crosstown Chicago White Sox; he ended his career there in 1955. In his 22-year major league career, Cavaretta compiled a .293 batting average with 95 home runs and 920 RBI. He later managed in the minor leagues from 1956 to 1958 and again from 1965 to 1972, became a coach and scout with the Tigers, and was a New York Mets organizational hitting instructor. Cavaretta was the last living player to have played against Babe Ruth in a major league game; he did so on May 12, 1935, against the Boston Braves. On December 18, 2010, Cavarretta died of complications from a stroke. He was also battling leukemia at the time of his death. ↑ Burns, Edward. "Cubs Beat Reds on Home Run by Rookie, 1 to 0." Chicago Tribune. September 26, 1934. p. 17.